← Howard Stern Hates Yoshiki? It quickly went to Facebook. People posted pictures. People shared locations where it could be found, and where it was selling out. What was this buzz about? 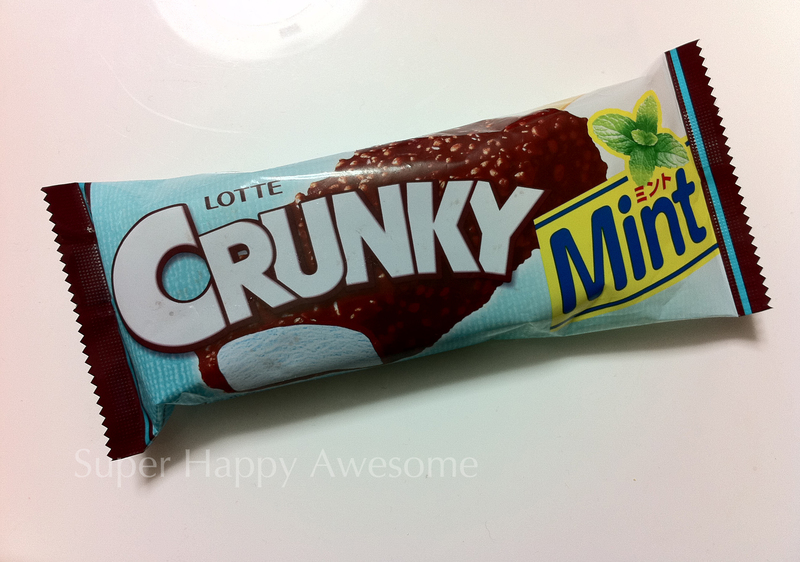 The Crunky Chocolate Mint Ice Cream Bar. Awwww yeaaaaaah. If it weren’t for practically everyone I know online raving about it, I might have passed by the bland, unassuming packaging and gone for the Black Thunder, or the old stand by, Haagen Dazs. I don’t particularly care for Crunky chocolates, either–they tend to be a bit waxy, I find. The name makes me giggle, but that’s about all they’re good for usually. I wonder if they know what “crunk” actually means, but I was pretty disappointed I didn’t get crazy or drunk the first time I tried it! But I picked one of these bars up, and damn, I’m glad I did! 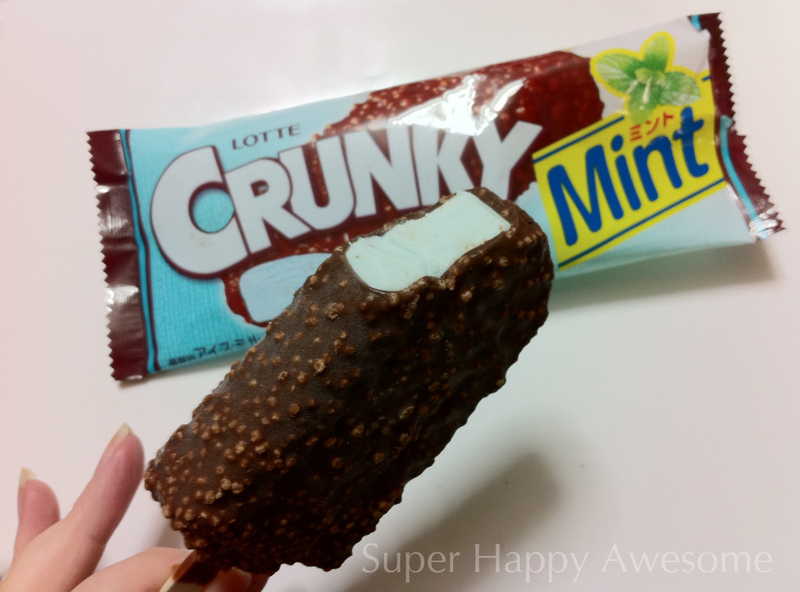 Creamy mint ice cream with a thick layer of dark chocolate, studded with crisped rice, this mint bar is totally worth swooning over. Refreshing and delightful. And it was only ¥126 at our corner combini, which is way more affordable than those fancy Haagen Dazs. So if you’re in Japan, pick one up! If not, well, come visit. It’s worth it. Have you gotten Crunk’d? What did you think? This entry was posted in Food! and tagged chocolate, crunky, Haagen Dazs, ice cream, mint, sweet. Bookmark the permalink. I am simply amazed at the perfect bite you took out of that ice cream in your photo! Mint chocolate is my absolute favorite and getting Crunk’d is the best…but nothing beats that perfect bite! lol. It’s RIDICULOUS. Simple, but soooo tasty! I’ve had this several times now. I want more! Haha, I like your equation! Excellent balance. And there’s calcium too, that’s very important during pregnancy, right? Have you tried the Black Thunder ice cream? I’m addicted to just the little chocolate bars that you find in the combini but the ice cream version is pretty damn good too. Only thing is it’s quite melty if you don’t eat it quick enough – dropped some on Little S’s head when I was feeding her the other day, world’s worst mummy or what? Ooh, I love black thunder! Though one of my students is obsessed with them, and I thought she was being SO RUDE the first time she mentioned it–then I pulled my mind out of the gutter, hahah. Hahahaha! I’m sure Little S didn’t mind, though when I was nannying the baby hated having his face wiped! Still, I’m sure as soon as she knows the joys of it, she’ll be grabbing it away from you! OMG~~!~ Yesssss. You blogged about this! So super, happy, awesome! ^O^ Seriously, the sheer promise of these every summer is enough to keep me in Japan for the rest of my life haha. I’m going to make a vlog about these soon~!